Time is running out” to help nuclear-armed Pakistan’s civilian government survive. That is what then-Senator John Kerry (D-MA) said in support of the recommendations of an Atlantic Council report that was released in February 2009. The report, which provided a comprehensive look at Western relations with Pakistan, estimated that, at that point, then-President Asif Ali Zardari’s government had between 6 and 12 months to enact successful security and economic policies or face the prospect of collapse. “There is still time for us to be able to help the new civilian government, turn around its economy, stabilize the political system, and address the insurgency” festering in the eastern tribal lands on the Afghan border, said Kerry. Today, as Kerry emerges from his first and much delayed visit to Pakistan as the current U.S. Secretary of State, he must have been struck by a sense of déjà vu. The mission that he and Hagel, now the U.S. Secretary of Defense, defined in 2009 remains largely unfinished. Pakistan has another civilian government facing an uphill task after the depradations of the previous one. Complicating the situation is the continuation of U.S. drone attacks on Pakistani soil that anger the Pakistani public and undermine the government’s ability to work with the United States, and Pakistan’s uncertain behavior regarding the Afghan Taliban that leads it to hedge in bringing them to the reconciliation table. Mistrust still pervades the U.S.-Pakistan relationship. Despite the change in names and positions, it is clear that with the anticipated clash of expectations regarding the hard economic and political realities of Afghanistan and South Asia, Pakistan today faces a tough task ahead, just as it did in 2009. Righting the U.S.-Pakistan relationship will take a longer-term plan of action, similar to one the Atlantic Council outlined four years ago. No Band-Aid approach of financial flows or even arms and equipment will work. The detailed recommendations provided in the 2009 report, and validated by discussions with Pakistan’s leaders, including then-opposition leader Muhammad Nawaz Sharif, Pakistan’s current Prime Minister, remain unimplemented. Secretaries Kerry and Hagel might do well to dust off the report they co-sponsored and see if they can persuade the Obama administration and the American public to appreciate the gravity of the situation in South Asia, while emphasizing the need for Pakistan to take ownership of its problems at a faster pace than the new government appears to be doing for now. Re-starting the dormant Strategic Dialogue, as Kerry did last week, is just one component of this bilateral relationship. Pakistan should rapidly select and appoint a person of intellectual and political heft to be its ambassador in Washington, as leaving that slot vacant has sent a negative signal. The much delayed invitation from the White House to Sharif is welcome as a signal of the rebuilding of a relationship that was badly cracked by the successive events of 2011, truly the annus horribilis of this fraught “friendship.” It is critical that the United States uses this reengagement to shore up the civilian government in Pakistan, even while it depends on the Pakistani military to help it exit Afghanistan in an orderly fashion. It will be even more critical for Pakistan’s civilian government to exhibit a strong desire and ability to take charge of key ministries. Energy appears to be front and center, and rightly so, though Sharif may want to rethink taking over the Ministries of Foreign Affairs and Defence. Being prime minister is a large enough challenge; he should let other professionals run these key ministries. If civilian supremacy is to be established with confidence in Pakistan, Sharif needs capable persons running those ministries fulltime and should let them rationalize their operations and produce doctrines that are practicable and far-reaching. Restoring the quality and strength of the federal and provincial bureaucracies is another key element in institutionalizing policy making. Pakistan’s problems are too big to be left to the highly personalized “kitchen cabinet” or Punjabi loyalists. Signals matter too. Last week’s selection of the new president did not reflect the need to honor a person of national or international standing with that post. Sharif chose a loyalist whom few in Pakistan knew before his nomination. Being a decent person, though necessary, is not enough for the job of Head of State. Sharif had much better candidates at hand but missed an opportunity to restore the grandeur and dignity of the office of President. On regional relations, Sharif has the right instincts of a good businessman and he needs to stick with them. Open borders with India and Afghanistan can only bring longer-term stability and peace. But then why the inordinate delay in granting India Most Favored Nation status? There will be short-term costs for some trade sectors, for example the Punjabi agriculturalists, but those can be mitigated by persuading India to roll back some of its internal subsidies, allowing both sides to gain from the increase in trade. A regional approach to energy, involving central Asia, Afghanistan, Pakistan, and India may be far more effective than the pipe dream of the Iran-Pakistan-India pipeline that has floundered on the shoals of global politics and threats of U.S. sanctions. Joint Indo-Pakistan private sector investments may be the key to rapid results, starting with export-oriented operations that will not threaten domestic producers or markets; provided the bureaucrats can be persuaded to loosen their grip on the rules and regulations that weigh things down. But what can the United States do regarding its relations with Pakistan? First, the administration can create a center of gravity for decision making on Pakistan, ensuring that there is a cohesive and comprehensive approach rather than departmental policies that may run at cross purposes. Then, it needs to ensure buy-in from the Pakistanis for its aid programs, including the Kerry-Lugar-Berman bill for $7.5 billion that will end in 2014. Adding transparency in financial flows from the United States to the central Pakistan government and down to the provincial level will allow the Pakistan people to trust the U.S. assistance and show that promises are measured against ground realities. It should also change the pattern of expenditures so the aid monies flow into Pakistan and stay there, rather than flowing back to Washington consultancies. Pakistan has the technological and managerial skills to implement, monitor, and evaluate aid projects to international standards. What it lacks is institutional capacity at the policy making level to make sound economic and financial decisions. This will require investing in centers of excellence across the country, where Pakistanis can learn the tools of decision making, and a new breed of managers and entrepreneurs is fostered. Pakistan needs help with its infrastructure, to connect itself internally and with neighbors, but the economy will only stabilize and grow if policy making keeps pace with its growing needs. A stable polity and growing economy will provide a platform for educating and developing productive jobs for the nearly 100 million Pakistani youth that are currently below Pakistan’s median age of 22 years. But this window of opportunity is narrowing for the governments of Pakistan and the United States. Sharif’s honeymoon with the Pakistani population will likely be shorter than expected, as high hopes clash with the inability of the government to deliver results rapidly. As such, he will need to approach these issues in parallel rather than seriatim. To best help Sharif in these efforts, the United States would do well to review, update, and implement the recommendations that then-Senators Kerry and Hagel supported in 2009. If it does not, it will likely repeat the bilateral relationship rollercoaster ride of the past decade and suffer the consequences. 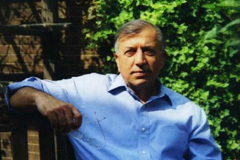 Shuja Nawaz is the director of the South Asia Center at the Atlantic Council. This essay was originally published by Foreign Policy.